Wonder what life's like for a IT apprentice after they've graduated with Distinction? Two months after passing his Infrastructure Technician apprenticeship qualification, 26 year-old Vinh tells us how he managed to get praise from the CEO of a multi-million pound company, which Firebrand courses he’s found most useful, and what led him to achieving a Distinction in his apprenticeship. Why did you go the apprenticeship route? I wanted to fast-track my career in IT, mainly due to the fact I could train for free with an apprenticeship, instead of paying large tuition fees at university. I found the off-site training with Firebrand better than on-site, because I got the chance to gain the full spectrum of knowledge and skills rather than only learning about issues that come up at work with the technology only we were using. I also wanted the full package of learning and work experience, rather than just going on training courses and not be able to instantly put my skills into practice. What’s your proudest moment of your apprenticeship? In the first few months of my apprenticeship I was troubleshooting an issue with a store in Milan and they lost internet. I calmly walked them through troubleshooting the local network on the phone to see any disconnections and if there was a setting that was off-key. Throughout, I remembered to be patient and not use jargon. There was a language barrier, too, which I needed to take into consideration when explaining what to do to the user on the phone. Turns out the issue was nothing in the store, it was an internet service provider issue which I resolved. It was a few weeks later that the company’s CEO told the Head of IT about how I had helped - it caught me completely off-guard! I felt that I was just doing my job, helping the store and this made me feel really impressed with myself. Now I make an effort to tell people who work closely with me when they’re doing a good job, too. What’s the coolest project you worked on? I’ve really enjoyed assessing the technologies between the business with a view to cutting down on costs because I know I’m making a difference. It also means I get to work out whether technologies fit within the core structure of the business overall. I’m not sure how much we’ve saved so far from the project, but I know it’s a lot! How have you implemented the skills you gained from your apprenticeship? What I’m doing is using the skills to assess the current resources I have in the workplace to troubleshoot issues, come up with alternative solutions and work-arounds in order to fix things. CompTIA A+ is probably the most useful course I did, as the course itself gave me different scenarios to think about what could be to troubleshoot that issue which was really relevant to my job role at Agent Provocateur. From the knowledge I’ve gained, I’m now responsible for introducing IT inductions into the business, which we’ve never had before. I noticed there were lots of duplicate questions and enquiries being made for our team to answer, but the process wasn’t streamlined enough which resulted in the team answering questions multiple times. To help streamline the service, I introduced IT inductions and also created documentation for employees to reference to help teach themselves before submitting a ticket to our team. I’m also writing the IT security handbook, which is so important especially when you hear security horror stories from other businesses! To make the business safer, I’ve shared ways of helping users stay safe - for example, locking your computer when employees aren’t at their desks. What was it like training at Firebrand with a mix of professionals? It was really nice to speak to a variety of people. Lots of them come from years and years of experience and were really willing to share their experiences with me so I could learn from them. I remember one student who worked in a prison, and I heard loads of crazy stories! He was there because he was overseeing upgrades within the organisation. I’ve never really heard from people in IT who work in prisons so it’s a nice insight into what he does in an industry I didn’t know about. Did you make friends with the others on your course? Definitely! When I took my 9 day Microsoft MCSAWindows Server 2012 course there were three of us who were keen to wind-down at the end of the day after the intensive 12-hour learning days. The course would usually finish between 7pm and 8pm, so we went for walks afterwards to clear our heads. I still talk to them a year on, and we’re great friends! What did you struggle with throughout your apprenticeship? Connecting the concepts. When I first started, a printer issue came up and I had to look at different components that led to the final solution itself. At first, I had to grasp those concepts to troubleshoot them, which I overcame through experience. I’ve now overcome a shyness to technology and I can now rise to any challenge that may come up. Do you think you’ll take on an apprentice yourself? Yeah, I would love to. I’ve been through the whole process, so even though the scheme will change it will be nice to walk my future apprentices through the whole process and move along with the apprenticeship scheme as it develops and improved. I keep telling my manager, Rob, “[Agent Provocateur] is an apprentice factory!” which is a great and progressive environment to be a part of. How did you feel when you found out you’d achieved a Distinction? When I got into work, I sat down and logged into my computer and looked at my emails. In my inbox I saw an email from my Learning Mentor with the subject line ‘Final grade’. I took a deep breath and told myself I’d be happy with a pass for my End Point Assessment, so I could manage my expectations. I opened the email and read “I’m very happy and glad to announce that you have achieved the grade of distinction” – word for word! When I saw it, I screamed with excitement! I didn’t realise until I noticed my colleagues were looking at me, so I decided to take myself outside and collect my excitement in my own space. Instantly, I replied to my Learning Mentor explaining it was beyond what I could comprehend. It was an amazing moment for me that I’ll never forget. Prepare, prepare, prepare. I watched lots of online videos on Pluralsight which were really helpful. Professor Messer’s YouTube channel is also brilliant! He’s a huge wiz on YouTube and does breakdown videos in bitesize chunks. What’s great is that you can watch one video for a couple of minutes and understand what he’s talking about - they’re really well presented, too, which meant the topics were easy to understand. What would you advise future employers of IT apprentices? Absolutely go for it. When I first joined, I had very little experience and knowledge but within 2 weeks I quickly developed my initiative and independence to pick things up quickly and work on everything. As we were a small team, this meant I could do things from my own initiative and be trusted to do so. You never know what you can get for apprentices unless you nurture and develop them. I’d recommend to employers to give their apprentices a chance to prove themselves, but also ensure they have the support network around them to succeed. What do you think employers can do to increase diversity in technology teams? Well, one thing I’d say is to employ an apprentice. Young people have different and fresh ideas of new concepts that they can bring to a team. When hiring, rather than looking at someone’s personal background I’d say to look at what they can bring to the team in terms of their personality and approach to working. It’s not all about where someone comes from. I would also recommend after-work groups to discuss how teams can diversify and create opportunities for certain groups of people. Perhaps they can introduce mentoring sessions to enable people from different backgrounds to have equal opportunities to develop. What did you think of Firebrand as an apprenticeship provider? I love them. I’m speaking from experience, as I’ve been with another provider so I can make comparisons. Firebrand really mentor and nurture you, setting you up to succeed the whole way. My Learning Mentor would send prompts to push me along and hints if I needed help. If I was stuck, she was always there to help but if she wasn’t available she’d find someone else for me to speak to. The instructors on the courses are all excellent and brilliant. They have so much experience behind them. Not only are you learning on the job, you’re listening to them and their personal experiences which are always so interesting. Would you recommend a Firebrand Apprenticeship to others? 100%. I had been interviewed by other training providers before Firebrand spoke to me, but I felt that Firebrand took the time to learn what I wanted out of a job and made sure my employer was right for me. When I applied to work for Agent Provocateur I just knew I wanted to work with them. The experience from the offset was personable when I went for my first and only interview with Agent Provocateur. They were there every step of the way, calling me before the interview with hints and tips and giving me questions for me to answer beforehand to prepare me. Throughout the whole apprenticeship Firebrand never made me feel alone and left out on a ledge to fend for myself. What’s next for your IT career? I’d like to move into an IT Engineer role, where I can work from site to site and talk to different people. It’d be great to experience working with and troubleshooting technologies I’ve never used before. For example, I’d like to get full exposure to server-side. I’m always out and about attending events and exhibitions, so it would be great to have that as a part of my job role too. Would you be happy to talk to current and future apprentices to talk about your experiences? Of course. Put them in touch! The Vinh Hoang is an IT Support Analyst at luxury lingerie company Agent Provocateur. He first started his Firebrand Apprenticeship back in 2015 and was offered a full-time position once he graduated. 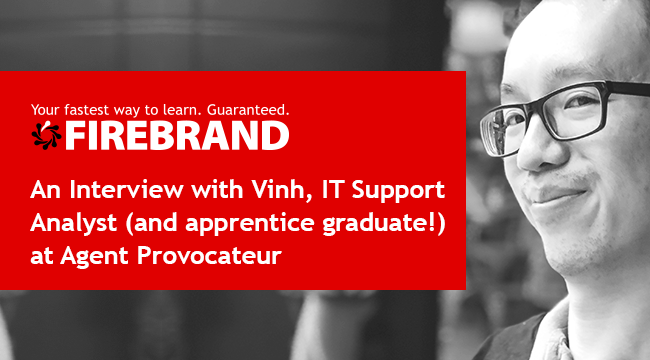 If you'd like to speak to Vinh about apprenticeships with Firebrand, email us and we'll put you in touch.